This substantial salad captures the vibrant flavours of summer in the Mediterranean. Preheat the oven to 250°C, gas mark 9. Put the tomatoes and the red pepper slices into an ovenproof dish. Drizzle with the olive oil and roast for 5 minutes. Switch off the oven and leave them in the residual heat for 10 minutes. Meanwhile, in a shallow bowl, toss together the remaining salad ingredients, except the pine nuts. Drain the tomatoes and peppers, reserving the oil, and stir into the salad. Make the dressing by whisking all the ingredients together with the reserved oil from the tomatoes and peppers. 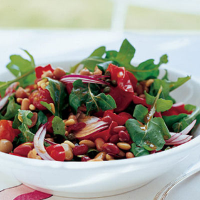 Drizzle over the salad and scatter with the toasted pine nuts. Cook's tip As with most salads, this is best made just before serving. However, if you want to get ahead, you can roast the tomatoes and peppers and make the dressing the day before. As with most salads, this is best made just before serving. However, if you want to get ahead, you can roast the tomatoes and peppers and make the dressing the day before.